5.1 х 2.8 х 0.8 in. 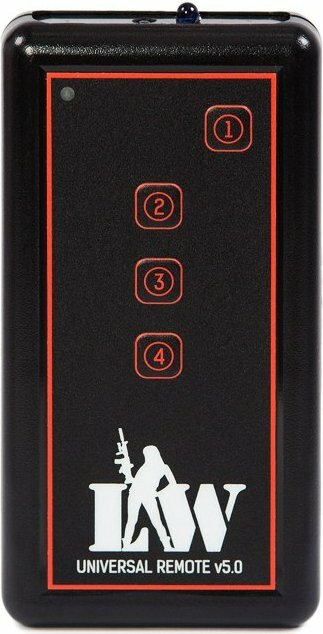 The basis of the laser tag Universal Remote is a specially designed motherboard. Its main difference from the previous board is improved wiring in power supply circuits and information tracks and SMD-elements. The quality of electronics was increased several times thanks to our three-layer components varnishing. The power source of the Universal Remote 5th generation is two AA batteries, (the fourth generation of Universal remote used 9V Batteries), and provides up to three months’ work (depending on usage). And the most important thing is that now you can change the game functions of the Universal Remote through the Laser Tag Configurator PC software. So, in using the Laser Tag Configurator, you can assign your own functions instead of the standard ones. To do so, connect the USB-base to the PC and run the Universal Remote in "admin-mode". To run in admin-mode, press the special button on the back panel of the remote with a paperclip, pin or, for instance, a toothpick. After changing the default settings, click on "Save". The Universal Remote will be ready for use. The new firmware allows you to program 8 functions instead of 4 in previous versions. In order to expand the functionality of the Universal Remote, you can use a special Shift mode. This adds the possibility of setting 4 additional functions from the Remote. To enter the Shift mode, you should press and hold the first button for 5 seconds. The Remote will indicate that it is running in Shift mode by short flashes of the LED. In Shift mode, the button's functions are changed according to the settings. To exit Shift mode, hold the first button for 5 seconds. If the user takes no action, the device automatically exits from Shift mode after 4 minutes and switches into a low power consumption mode.